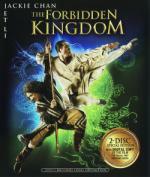 I was interested in seeing Forbidden Kingdom when the movie came out a few years ago, but I didn't get the chance to see it then. I ended up seeing it after it was released on DVD and I enjoyed it. I decided to pick up the Blu-ray of the movie a few months ago when I found it for like $15. The plot is interesting with having a teenager who likes kung fu movies travel through time and end up in ancient China. A few elements of the plot could be a little stronger, but overall the movie is really entertaining. There are lots of fights, but the story is developed enough for it to make sense. There are some mystical or magical type of things involved and those things work with what is going on. This is the first movie that Jackie Chan and Jet Li have made together. I think it is still the only one they've made together, though I might be wrong about that. Both of them are very impressive with their martial arts abilities. Their characters aren't enemies, though they aren't exactly friends either and they do end up fighting at one point. The fight is done well, though some of their fans may be disappointed that it didn't last longer. All the fights are done well and look really impressive. Some wire work is done in some scenes. I don't think there is much CGI to the fight scenes. The Blu-ray has several extras focused on different aspects of the making of the movie that are very interesting and worth watching. The movie was filmed at various locations around China. The different locations look gorgeous on Blu-ray. This is a very entertaining movie that is well worth watching, especially for fans of Chan or Li.